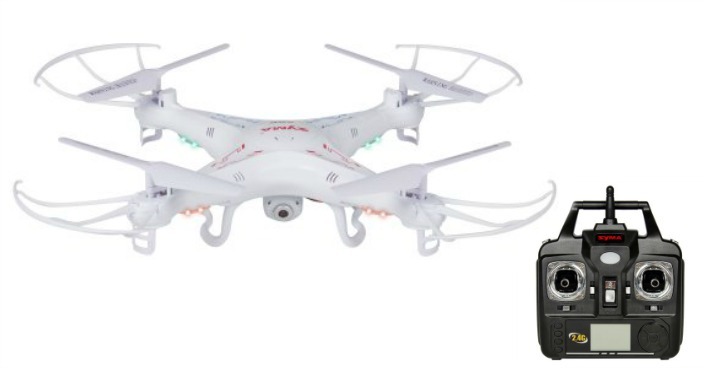 RC 6-Axis Quadcopter Flying Drone Just $44.94! Down From $120! You are here: Home / Great Deals / RC 6-Axis Quadcopter Flying Drone Just $44.94! Down From $120! Right now you can get this RC 6-Axis Quadcopter Flying Drone for just $44.94 (Reg. $120) at Walmart! Best Choice Products is proud to present this new Quadcopter with HD Camera. This new copter contains many great functions to provide you the best experience and the best views. Simply attach the included protecting frames and skids, install the battery, camera, and SD card, and the copter will be ready to go. With the provided controller, simply turn on the switch and one is able to control the quad copter and take it on an adventure. The copter comes equipped with different lights that shine to help identify the aircraft when it is in the air. The greatest feature is that this copter comes with a high quality camera that can record the trip and reach great heights. With its 6 axis gyroscope, the quadcopter can hover over the heights while one records great views. The copter is very easy to control and it does comes with extra propellers in case one of them breaks. The possibilities of fun, adventures, and excitement are endless.